Vascular access is frequently required in hospitalized children for a variety of clinical indications. This requirement may range from short-term or temporary needs to long-term or even permanent access. Various options for vascular access are available to the physician who cares for children to meet the required treatment needs. To help minimize the number of attempts and the trauma to the child and the family, the indication for and duration of vascular access should be carefully considered before placement is attempted. The physician should have a thorough knowledge of the anatomy, confidence in undertaking the procedure, and awareness of the likely complications associated with each type of access. After the catheter is in place, careful handling and strict aseptic technique are required during the care and maintenance of the line to reduce the risk of infection. Careful vigilance is required to prevent both acute and long-term catheter-related problems. For patient education resources, see the Circulatory Problems Center, as well as Venous Access Devices. Peripheral short-term catheters are safe for giving many intravenous (IV) medications (eg, antibiotics), for providing maintenance IV fluids, and for blood sampling for laboratory tests. However, numerous fluids and medications (eg, hyperosmolar solutions and resuscitative drugs) cannot be given through peripheral catheters because of local and venous irritation. The decision to obtain vascular access can be a major challenge to the physician. It is complicated by factors such as the patient's age and size, the availability of venous access sites, and even the anticipated length of use. The length of anticipated use, which ranges from short-term or temporary to long-term and even permanent, must be considered when the decision is made to obtain access because this may affect the choice of catheter. For example, as noted (see Indications), although peripheral vascular catheters can be used for a variety of indications, such as the administration of IV fluids and numerous medications, they cannot be used for chemotherapy or TPN. Peripheral venous catheters are the most commonly used catheters in most hospital settings. They are relatively safe and easy to insert. Improvements in technology have produced catheters with small calibers, resistance to bacterial colonization, and lowered rates of thrombotic complications. They can be used for a variety of indications and are safe with a variety of commonly administered medications. The dorsal veins of the hands are excellent choices for catheterization, and they should be the first choices in the placement of peripheral catheters. The dorsal veins of the foot are excellent first choices in neonates and infants but should be avoided in older children (eg, toddlers) if possible because catheters placed here are painful and difficult to maintain without becoming easily dislodged. Superficial scalp veins (frontal, superficial temporal, posterior auricular, and occipital veins) are also convenient access points in neonates, but shaving of the surrounding hair is required, and the catheters can be difficult to maintain. Care must also be taken when scalp veins are used to avoid inadvertent cannulation of the temporal artery or one of its branches. Although other veins, such as the median antecubital, basilic and median cephalic veins are relatively large and easy to cannulate, these sites should be reserved as second choices in case a percutaneously inserted central catheter (PICC) or venous cutdown is required. The great saphenous vein (GSV) is another excellent choice in the pediatric population because of its large size and consistent anatomy. This vein can often be cannulated with ease without direct visualization or palpation. With a sound knowledge of the anatomy, the femoral vein is another potential site for vascular access. However, because of concerns with infection and thrombotic complications, this site is generally used only in emergency situations. Extreme care must be taken when femoral lines are inserted to avoid damage to the femoral nerve or artery. These lines are best used for short-term access because of their proximity to the groin. Ater insertion, care should be taken to keep the insertion site as clean as possible to minimize the risk of line infection. Finally, the external jugular vein may be used to gain vascular access (see the image below). External jugular veins can be difficult to cannulate because the infant must often be restrained and placed in a dependent position to allow the veins to be visualized. In addition, catheters are difficult to stabilize here and frequently become dislodged; these disadvantages preclude their routine use in this site. Percutaneous external jugular vein access. Note that head is in dependent position to allow filling of vein. When placing peripheral catheters, the physician may use tourniquets, transillumination, or heat lamps to facilitate insertion. Infants and small children may also benefit from the application of local anesthetic agents (eg, lidocaine and prilocaine [EMLA] cream) to the insertion site to minimize pain and discomfort during catheter placement. When using topical anesthetic creams, one must plan in advance to allow at least 1 hour for the cream to provide the desired effect. Care should also be taken in selecting an anesthetic agent; some may cause vasoconstriction of the vessel, making insertion more difficult. When placing a peripheral catheter, the physician should always anticipate the need for adequate restraint. Parents and nursing staff can help minimize movement of the child during catheter placement. After the peripheral catheter is placed, adequate stabilization should be used to prevent its dislodgement. Tape and an arm board might be applied to the extremity. A "flashback" of blood into the catheter tubing may not occur in infants, leading the physician to assume that the catheter is improperly placed. In such a case, the catheter should be flushed with sterile normal sodium chloride solution. Infiltration of surrounding tissues with this solution indicates improper placement. Peripheral access can be gained by using a surgical venous cutdown. In the past, this method was frequently used in children in whom access was difficult or in emergency situations. However, this technique has fallen out of favor because of its related morbidity, relatively short patency, and technical difficulty. This technique still has a limited role in emergency situations when other peripheral and intraosseous attempts fail. The cutdown approach poses virtually no risk of pneumothorax or hemothorax and allows direct visualization of the vein. The exposed veins are often of small caliber, and this limits the size of the catheter that can be used. In addition, the distal end of the vein is typically ligated; therefore, the vein is precluded from use as future vascular access. Although the GSV is usually the primary choice for surgical venous access, the antecubital and femoral vessels can also be used. The course of the GSV anterior to the medial malleolus of the tibia makes it a popular choice for cutdown access (see the image below). Saphenous vein cutdown. 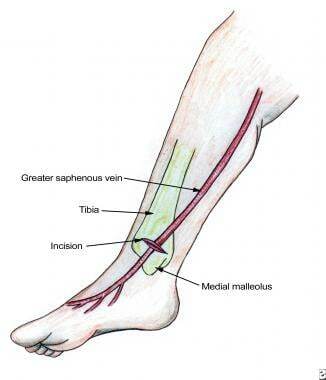 Note relation of saphenous vein to medial malleolus. Linear incision is made perpendicular to vein. To perform a saphenous cutdown procedure, a sterile field is prepared with the lower extremity immobilized and the foot turned laterally. After 1% lidocaine is subcutaneously injected over the vein, an incision is made perpendicular to the vein. 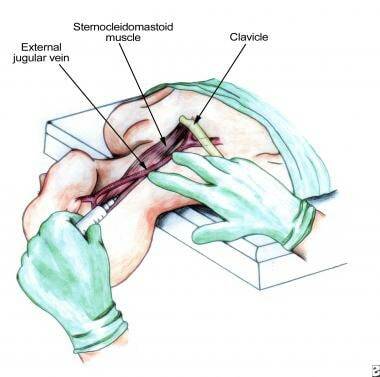 Careful blunt dissection of the subcutaneous tissue with a hemostat is used to isolate the vein. Silk sutures are then looped around the vein, one proximally and one distally. The distal loop may be used to ligate the vein. 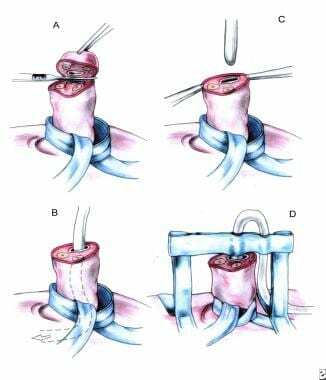 Gentle tension is then applied to the proximal vessel loop, and a venotomy is made with a No. 11 blade in a parallel fashion to avoid transection of the vessel (see the image below). Saphenous vein venotomy. 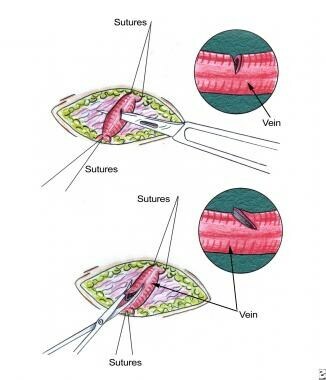 Venotomy is made during saphenous vein cutdown with No. 11 blade (or iris scissors). Care must be taken to avoid complete transection of vein. Venotomy should be made parallel with vein to avoid this complication. The cannula is then inserted into the vein and secured in place by tying the proximal loop. Care must be taken to avoid occluding the cannula (see the image below). The wound is closed with sutures and dressed. In infants and newborns, the saphenous vein can be accessed at the level of the femoral junction in the proximal thigh. Insertion of saphenous vein catheter. After vein is located and venotomy performed, catheter is inserted into vein. Use of proximal suture loop can facilitate catheter placement. Although peripheral catheters are commonly used, they are all limited to short-term usage, small-to-moderate infusion volumes, and low-osmolarity solutions. The most common complication of peripheral catheter placement is dislodgment or occlusion, which leads to extravasation of fluids into the extravascular tissues. If this occurs, the catheter should be removed. Extravasation of infusates, especially those of a hypertonic or irritative nature, can have dire consequences, such as tissue necrosis and compartment syndrome. Intraosseous catheters were commonly used in the past, but with advances in IV catheters and alternative access techniques, their use has declined. However, the intraosseous catheter still has a major role in life-threatening emergency situations when other access methods fail and when time is of the utmost importance. Intraosseous vascular access is based on the anatomic presence of noncollapsible veins in the medullary sinuses in the bone marrow (see the image below). This venous network drains directly into the central venous circulation by means of emissary veins, resulting in rapid and almost immediate absorption. A variety of drugs (including resuscitation drugs), crystalloid solutions, and even blood products may be given rapidly via the intraosseous route. The large bore of these catheters enables the administration of blood without lysis of red blood cells (RBCs). Venous drainage of bone marrow. Venous network of bone marrow is used for intraosseous puncture to obtain vascular access. Achievement of intraosseous vascular access is simple, rapid, and consistent when known anatomic landmarks are used. In infants and small children, the proximal tibia is the primary choice for insertion. In older children and adolescents, the sternum can be accessed. Other sites for insertion include the distal tibia, distal femur, distal radius, and os calcis. Like all other catheters, intraosseous catheters should not be placed in an already injured limb. For placement in the proximal tibia, the anatomic landmarks must first be recognized. 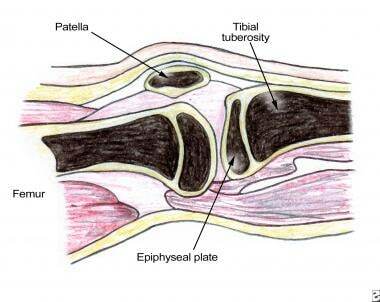 With a large-bore (16- or 18-gauge) bone-aspiration needle, the insertion is made 1-3 cm below and just medial to the tibial tuberosity by advancing through bone into the marrow space (see the image below). Correct placement is confirmed with the aspiration of marrow and with the easy infusion of fluid. Lower-extremity anatomy for intraosseous vascular access. Intraosseous needle is placed approximately 1-3 cm below tibial tuberosity. Complications are rare with intraosseous vascular access, but they have been reported. The most common reported complication is osteomyelitis, but this is rare (< 1%). Other complications include fracture, compartment syndrome, leakage at the insertion site, and failure of infusion due to bending of the needle or occlusion of the needle with bone marrow. Intraosseous catheters are not recommended for long-term use and should be removed within 12-24 hours after their insertion. PICC lines have become increasingly popular in patients who require intermediate- to long-term venous access. They have become the most popular form of vascular access in the neonatal intensive care unit (NICU). PICC lines share attributes of both peripheral and central venous access and are readily inserted at the bedside under strictly sterile conditions (as for all centrally placed vascular catheters). PICC lines are composed of biocompatible materials and come in a variety of sizes. Large PICCs can have multiple lumina. Careful attention must be paid to choosing a suitable vein. The GSV and the veins of the antecubital fossa (basilic, brachial, cephalic vein) are those most commonly used in clinical practice. After a suitable vein is located (with the help of ultrasonographic [US] guidance if necessary),  the PICC line is inserted into the peripheral vein by using a peel-away introducer needle. When the vein is successfully cannulated, the catheter is the advanced to a desired length into a large central vein. Correct positioning of the PICC line is then confirmed with a chest radiograph. PICC lines are suitable for a number of indications, including TPN, blood sampling, and administration of nearly all medications. They can be used in both the hospital and home setting, a feature that makes them a popular choice for outpatient therapy. PICC lines offer many advantages in the pediatric population, including lowered overall cost and risks compared with surgical vascular-access methods. In addition, they have a solid record of efficacy. Although no evidence suggests that PICC lines decrease the risks of infection or thrombotic complications, they virtually eliminate the problems of pneumothorax, air embolization, and cardiac arrhythmias. PICC lines are less likely than traditional peripheral vascular-access methods to become dislodged, and they can be easily removed when treatment is stopped or when complications (eg, infection or phlebitis) occur. Because of their often small lumen, one disadvantage of using PICC lines is an increased occlusion rate. Another concern is overusage that potentially exhausts upper-extremity venous-access sites. This may have serious implications in chronically ill patients, especially those with renal failure who may eventually require arteriovenous fistulas for dialysis access. Various veins are suitable for polyethylene catheters, including the subclavian, internal jugular, and femoral veins. Like PICC lines, polyethylene catheters can be readily placed on an elective basis or in an emergency situation. They can usually be placed with only local anesthesia, depending on the child's age and cooperativeness, by using the Seldinger technique. A number of CVCs are available with either a single lumen or multiple lumina. After a suitable vein is located, a sterile field is prepared. For the Seldinger technique, the patient is positioned appropriately in the Trendelenburg position to access the subclavian and internal jugular veins or in a flat-to-reverse Trendelenburg position to access the femoral veins. Local anesthetic (1% lidocaine) is injected locally. Young children may require light, monitored sedation. 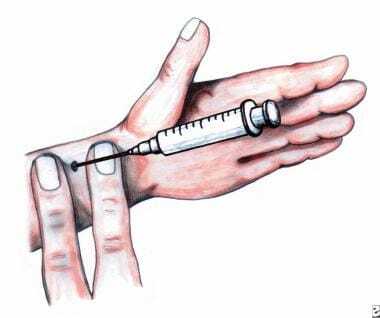 The syringe and needle are then passed subcutaneously in the direction of the vessel with constant negative pressure applied to the syringe; this point cannot be stressed strongly enough. When venous blood returns to the syringe, needle advancement is stopped. Should no blood return, the needle is completely withdrawn, and another attempt is made. Attempts to adjust the needle in the tissue pose a risk of damaging the surrounding tissues, including the vein, artery, and nerve. When blood is aspirated, the syringe is removed, and the guide wire is advanced through the needle into the vein. The guide wire should pass easily. If resistance is met, no attempt should be made to advance the wire further. 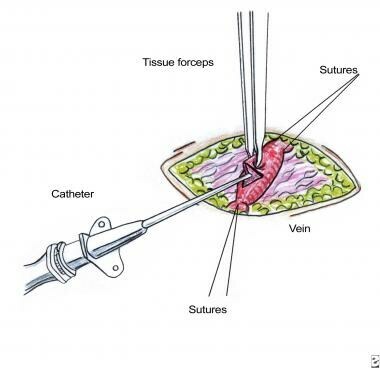 In this case, the wire should be carefully withdrawn; the syringe should be reattached to the needle, and a further attempt is made to aspirate blood. If no blood is aspirated, the needle is withdrawn, and a further attempt is undertaken. If blood is aspirated, the needle can be carefully rotated 90°, and a second attempt at passing the wire is made. Difficulty in passing the guide wire should alert the physician to obtain additional help, including radiographic guidance if necessary. Care must also be taken to maintain control of the guide wire at all times. If the guide wire meets no resistance, it is inserted a few centimeters into the vein. Careful attention should be paid to the electrocardiography (ECG) monitor, if available, in order to detect and avoid cardiac arrhythmias. After the guide wire is in place, the needle is carefully removed to avoid dislodging the wire. A small incision is made in the skin at the insertion site. This incision should be no bigger than the width of the catheter to be inserted. Many CVC kits contain dilators, which can be used with extreme caution. Again, these should pass without resistance. The catheter is then threaded over the wire and into the vessel. This is a critical point where strict control of the wire must be maintained to avoid losing it in the vein. After the catheter is in place, each lumen should be aspirated to prevent an air embolism. Blood should be easily withdrawn from all lumina. The lumina are then flushed with heparinized sodium chloride solution; the catheter is secured to the skin with more than one suture. The insertion site is covered with a sterile dressing. 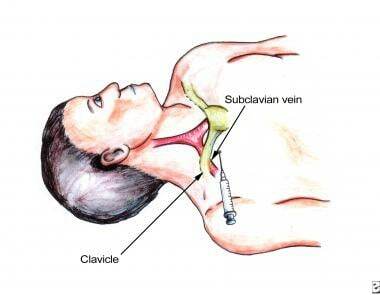 The subclavian vein is the preferred route for central venous access (see the image below). However, careful attention must be paid when CVCs are inserted in this position, and the physician must have thorough knowledge of the central venous anatomy so as to minimize potential complications. The subclavian vein site is well tolerated by children, it is easy to dress and monitor, and it has good patency. Percutaneous subclavian vascular access. Anatomic landmarks should be clearly identified before vascular access is attempted. 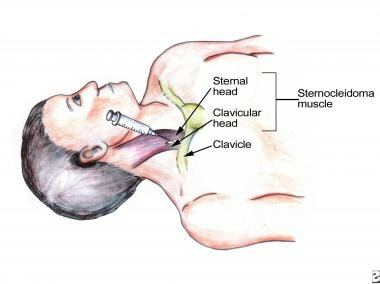 Needle is guided toward sternal notch. The subclavian vein is accessed by means of the infraclavicular approach at a point inferior and lateral to the midclavicular bend. The needle is inserted toward the suprasternal notch by guiding the needle posteriorly at an angle of approximately 30° to the chest wall. In children younger than 1 year, the subclavian vein arches superiorly. This variation must be taken into account when vascular access is obtained in this population. Percutaneous internal jugular venous access. Anatomic landmarks and carotid artery must be clearly identified before venous access is attempted. Carotid artery lies medial to vein. Needle is inserted at apex of triangle formed by two heads of sternocleidomastoid. Like polyethylene central catheters, silicone catheters (eg, Broviac or Hickman catheters) are percutaneously placed into a central vein, but they are tunneled a distance from the insertion site. For this reason, they are the preferred percutaneous catheter for long-term treatment needs, such as TPN or chemotherapy. Silicone catheters are more pliable and less traumatic to veins than polyethylene catheters are. In addition, they have an attached cuff near the proximal end, which is often impregnated with antibiotics. Taken together, the tunneled feature and the cuff improve the stability of the catheter and decrease the risk of infection. Evidence suggests a lowered rate of thrombotic complications with silicone catheters because of their increased pliability, but this assertion has not been conclusively demonstrated in clinical trials. Various silicone catheters are available in both single-lumen and double-lumen formats. Because of the tunneled feature, silicone catheters require surgical insertion. The subclavian, internal jugular, and femoral veins can be used. In neonates, the external jugular vein and the GSV can also be selected. The catheter is advanced under fluoroscopic guidance to ensure correct placement. The extravascular portion of the catheter is then tunneled under the skin to an exit site, which is usually on the anterior chest wall. Once inserted, they are sutured in place, flushed with heparinized sodium chloride solution, and covered with an appropriate dressing. Implantable vascular-access devices, or ports, have become the device of choice for patients who require long-term or even permanent access. Ports eliminate many of the problems associated with CVCs, such as infection, restriction of daily activities, altered body image, and the need for frequent dressing changes. Central venous lines with implantable subcutaneous ports (or reservoirs) are an excellent and often preferred means of vascular access in pediatric patients with cancer. These catheters have excellent durability, as they can often be accessed more than 100 times, and the overlying skin acts as a protective barrier for infection. These types of catheters improve the cosmetic appearance, they allow for regular activities, and they do not require frequent dressing changes or special handling. A number of devices are commercially available (eg, Port-A-Cath, Mediport) with either single- or double-lumen injection ports. Such devices consist of an injection port made from a durable, hard protective shell (eg, titanium) with an overlying silicone diaphragm, which is surgically implanted in the subcutaneous tissue (commonly the anterior chest wall). The injection port is connected to a silicone catheter, which is placed into the vein by means of the Seldinger technique or direct cutdown. Like silicone venous catheters, ports are tunneled a distance from the access point. Because of the size of the port, children must usually weigh more than 10 kg to be good candidates for port placement. To access the port, a Huber needle (a special side-holed needle) is used to puncture the diaphragm. The needle does not damage the diaphragm and allows the device to be used repeatedly for long-term access. After the surgical site heals, the port requires no local care or dressings. The major advantage of ports is a substantially lowered rate of infection in comparison with other access devices. One disadvantage is that ports require surgical insertion and removal when treatment ceases or complications arise. The umbilical vein can be used as an access site in neonates during the first few days of life. After the first few days of life, surgical cutdown may be required to access the umbilical vein. Like other venous-access sites, umbilical venous access can be used for blood sampling, fluid and drug administration, and even monitoring of central venous pressure (see Table 2 below). Two umbilical arteries are present in the umbilical stump, and these may be used to monitor arterial blood pressure, sample blood, and administer fluids and drugs. * Umbilical-artery catheterization should not be used when peritonitis, necrotizing enterocolitis, omphalocele, or gastroschisis is present. The umbilical cord typically contains three vessels: one umbilical vein and two arteries. The umbilical vein is usually the largest of the three vessels, has a thin wall, and is located the 12-o'clock position. For umbilical venous acess, the child must be supine and restrained. A sterile field is then created around the umbilicus. A silk suture is looped around the base of the umbilical stump (see the image below). Umbilical vein catheterization. (A) Umbilical tape or silk suture is looped around base of umbilicus, and distal umbilical stump is removed. (B) Umbilical vein is located (usually in 12-o'clock position), and lumen is exposed. (C) Catheter is advanced into lumen. (D) After satisfactory position is achieved, catheter is secured in place. The distal stump is then incised off, and the vessels are quickly occluded to prevent excess blood loss. After the vessel is located, a cannula is passed directly into the vessel, and the tip is advanced to a point above the celiac axis for umbilical-artery lines. For venous access, the catheter tip should go into the umbilical vein and into the inferior vena cava. The catheter tip should be at the level of the inferior vena cava next to the diaphragm. A plain abdominal radiograph is used to confirm placement. Use of the azygos and hemiazygos veins requires formal thoracotomy, which limits the potential of these approaches. Intercostal veins can usually be accessed without formal thoracotomy. The inferior epigastric and lumbar veins can be accessed with a surgical cutdown procedure. Before access to these sites is attempted, the physician should consult an interventional radiologist. Radiologic intervention may assist in locating the most suitable veins for access. Arterial cannulation is required to assess blood gases and to perform continuous monitoring of blood pressure, especially in critically ill patients. A number of sites are available, including the radial, axillary, femoral, posterior tibial, and dorsalis pedis arteries. Because of poor collateral flow, the brachial artery should not be used. Likewise, the temporal artery should not be used, because of the risk of thrombotic complications. The radial artery is most frequently used because of the ease of access at this point. Before the radial artery (or any other artery) is cannulated, an Allen test is performed to assess for adequate collateral flow, and the results should be clearly documented in the patient's chart. An Allen test for the radial artery is performed by occluding both the radial and ulnar arteries at the wrist. One of the arteries (not the one chosen for cannulation) is then released, and the patient's hand is checked for return of blood flow; the hand should remain perfused. A successful result on the Allen test demonstrates collateral flow between the arteries. After the artery is located, the field is sanitized, and the index and middle fingers of the operator's nondominant hand are placed on the artery to assess the pulse wave (see the image below). Arterial cannulation of radial artery. Two fingers are placed at wrist to locate and help visualize course of artery. Artery is then cannulated after collateral flow is assessed (Allen test). In this way, the operator can mentally visualize the course of the artery. The needle is then inserted into the artery. After the needle is withdrawn, pressure must be applied to promote hemostasis and to prevent hematoma formation. Simply placing a bandage at the site without direct pressure is unacceptable. Complications associated with vascular access can be divided into two broad categories, acute (ie, during the insertion period or shortly after) and long-term (see Table 3 below). DVT = deep vein thrombosis. The physician should have a thorough knowledge of the anatomy and of the potential complications from the procedure in order to be able to identify and quickly treat any complications that may arise. In addition, the physician should have working knowledge of the vascular-access device to be used to avoid confusion and potential mishandling of the catheter. Finally, a thorough preoperative evaluation should be undertaken. It should include a review of the results of coagulation studies and attention to the placement of previous vascular-access devices. Informed consent should be obtained and documented on the patient's chart. Pneumothorax is the most common acute complication with central venous access, with reported rates as high as 4%. For this reason, an upright chest radiograph (or lateral decubitus image if the patient cannot sit upright) should be obtained after central venous access is attempted. The physician should personally view the image after the procedure and obtain radiologic interpretation if necessary. Small (< 10%), uncomplicated pneumothoraces usually do not require immediate evacuation unless evidence of compromised ventilation is present. Small pneumothoraces should be monitored to ensure that they resolve satisfactorily; they usually resolve spontaneously at a rate of approximately 1% per day. Failure of a small pneumothorax to resolve, an enlarging pneumothorax, or ventilatory compromise is an indication for evacuation (eg, with a thoracostomy tube). Of note, central venous lines that surgeons placed in the operating room rarely result in pneumothorax or bleeding complications. Other complications are listed in Table 3, but this list is by no means exhaustive. Apart from the strategies described above, other measures to reduce complications include proper patient positioning, adequate assistance (eg, for restraint), holding positive-pressure ventilation during needle insertion, and radiologic (eg, fluoroscopic) guidance. Infection is the most common complication of long-term vascular access. The incidence of infection varies depending on the type of catheter, the location of placement, and the patient population. As a rule, any central venous line that is used for long-term access is prone to become infected at least once. Despite speculation that certain types of catheters are associated with high infection rates, the literature does not support these claims except in the case of implantable vascular-access devices. Numerous clinical factors have also been implicated in catheter-related infections, including the patient's age. Rates of infection are highest in the neonatal population and in patients with short-bowel syndrome, neutropenia, or other chronic illnesses. Catheter infection is suspected in patients with a vascular-access device when they have a fever and when an identifiable bacterium is isolated from blood samples and the catheter device. Erythema surrounding the catheter exit site may represent only skin irritation. Therefore, it is important to attempt to determine if the catheter is truly the source of infection. Attempts may be made to salvage the catheter by empirically administering antibiotics through the catheter. In critically ill children, the most prudent advice is to remove the catheter and to attempt vascular access at a point away from the infected area. However, limitations in the venous access sites available in chronically or critically ill children should be considered before a catheter is removed. In most children, removing the infected catheter eliminates the source of infection. Empiric antibiotics may not be warranted unless the child has signs of sepsis. Commencing broad-spectrum antibiotics is generally warranted in critically ill children after appropriate cultures are obtained. The physician should consult local infection control and antibiotic policies before commencing antibiotics. If antibiotics are started, they should cover coagulase-negative staphylococci because these are most frequently identified as the organisms responsible for CVC infection. Antibiotics should be continued for at least 48 hours or until cultures results are available. After 48 hours, the patient's clinical condition should be reassessed, and the antibiotics are discontinued if they are no longer needed to prevent antimicrobial resistance. Tenderness, induration, erythema, and, occasionally, purulent drainage at the exit site may represent a subcutaneous tunnel or port-pocket infection. This type of infection usually requires removal of the venous access device and treatment with IV antibiotics as necessary. As a rule, most catheter-related infections can be successfully treated with IV antibiotics without line removal. However, line removal and appropriate anti-microbial therapy are often needed to manage infections caused by fungal microorganisms or gram-negative bacteria. Venous thrombosis is another frequent complication of long-term venous access. Several etiologic factors are implicated in thrombosis of vascular-access devices, including the type, size, and location of the catheter, as well as the patient's underlying condition. Large catheters with multiple lumina likely disturb the surrounding blood flow, leading to thrombosis. Catheter-associated thrombi may range from small accumulations of fibrinous material in or around the catheter to large, potentially fatal thrombi. Clinically significant thrombosis can result in total occlusion of the vessel, thromboembolism (eg, clot in the right atrium or a pulmonary embolism), or superior vena cava syndrome. Patients with suspected venous obstruction should undergo venography, echocardiography, or spiral computed tomography (CT) to locate the thrombus. In general, children with clinically proven vascular thrombosis should be treated with anticoagulants (eg, heparin for 7-10 days). Evidence suggests a strong association between thrombosis and infection. Again, all healthcare workers must exercise extreme vigilance when a vascular-access device is being used. When catheter patency is reduced because of partial thrombosis, streptokinase, tissue-type plasminogen activator, urokinase, and heparin have all been used with success. Evidence supports the prophylactic use of urokinase to flush the catheter; this technique improves catheter patency. Central vascular-access devices should be flushed regularly (eg, with heparinized sodium chloride solution, urokinase) to help reduce the incidence of thrombotic occlusion. Chronic vascular thrombosis and occlusion is not unusual in children who have had several previous central lines. For this reason, vascular US, angiography, or both may be helpful before central lines are inserted in these children. Stovroff M, Teague WG. Intravenous access in infants and children. Pediatr Clin North Am. 1998 Dec. 45 (6):1373-93, viii. [Medline]. Othersen HB Jr, Hebra A, Chessman KH, et al. Central lines in parenteral nutrition. Baker RD Jr, Baker SS, Davis AM, eds. Pediatric Parenteral Nutrition. New York: Chapman and Hall; 1997. 254-71. Hamzeh RK, Danon S, Shah S, Levi DS, Moore JW. "Wire-target" technique for precise vascular access. Tex Heart Inst J. 2009. 36 (4):321-6. [Medline]. [Full Text]. Bagwell CE, Salzberg AM, Sonnino RE, Haynes JH. Potentially lethal complications of central venous catheter placement. J Pediatr Surg. 2000 May. 35 (5):709-13. [Medline]. American College of Surgeons Committee on Trauma. Advanced Trauma Life Support Student Course Manual. 9th ed. Chicago: American College of Surgeons; 2012. Smith R, Davis N, Bouamra O, Lecky F. The utilisation of intraosseous infusion in the resuscitation of paediatric major trauma patients. Injury. 2005 Sep. 36 (9):1034-8; discussion 1039. [Medline]. Kumar A, Chuan A. Ultrasound guided vascular access: efficacy and safety. Best Pract Res Clin Anaesthesiol. 2009 Sep. 23 (3):299-311. [Medline]. Chung DH, Ziegler MM. Central venous catheter access. Nutrition. 1998 Jan. 14 (1):119-23. [Medline]. Chiang VW, Baskin MN. Uses and complications of central venous catheters inserted in a pediatric emergency department. Pediatr Emerg Care. 2000 Aug. 16 (4):230-2. [Medline]. Criss CN, Claflin J, Ralls MW, Gadepalli SK, Jarboe MD. Obtaining central access in challenging pediatric patients. Pediatr Surg Int. 2018 May. 34 (5):529-533. [Medline]. Oulego-Erroz I, Muñoz-Lozón A, Alonso-Quintela P, Rodríguez-Nuñez A. Comparison of ultrasound guided brachiocephalic and internal jugular vein cannulation in critically ill children. J Crit Care. 2016 Oct. 35:133-7. [Medline]. Habas F, Baleine J, Milési C, Combes C, Didelot MN, Romano-Bertrand S, et al. Supraclavicular catheterization of the brachiocephalic vein: a way to prevent or reduce catheter maintenance-related complications in children. Eur J Pediatr. 2018 Mar. 177 (3):451-459. [Medline]. Budruddin M, Mohsin N, Amitabh J, Ehab M, Pramod K, Abbas P, et al. Femoral vein tunneled catheters as a last resort to vascular access: report of five cases and review of literature. Ren Fail. 2009. 31 (4):320-2. [Medline]. Chesshyre E, Goff Z, Bowen A, Carapetis J. The prevention, diagnosis and management of central venous line infections in children. J Infect. 2015 Jun. 71 Suppl 1:S59-75. [Medline]. Chan AP, Baldivia PS, Reyen LE, Lund AN, Marcus EA, Venick RS, et al. Central venous catheter repair is highly successful in children with intestinal failure. J Pediatr Surg. 2018 Jun 9. [Medline]. Janum S, Zingg W, Classen V, Afshari A. Bench-to-bedside review: Challenges of diagnosis, care and prevention of central catheter-related bloodstream infections in children. Crit Care. 2013 Aug 28. 17 (4):238. [Medline]. [Full Text]. Algorithm for emergency venous access. IV=intravenous.